I have this for my phantom 3 advanced and no issues at all with it. I even done a video review of it on YouTube. Is there anything it doesn't do compared to the OE battery? I think my biggest concern with 3rd party batteries would be future updates relating to battery and/or Phantom itself and whether or not the "intelligent" battery would be compatible to the updates. DJI has been known to chnage the battery firmware so that non-DJI batteries will not work. Also, you _never_ know the quality of the batteries bought from 3rd parties as you can't know where they are getting each batch from. Lastly, if something goes wrong and you seek coverage under warranty, there is a good possibility that DJI may not honor the warranty if you use a 3rd party battery. Yes, you can save about $20 per battery. You gamble all of that for about $20. I watched my buddy's P3 fall out of the sky with 18% battery level remaining on a knock off. Has anyone took a gamble on a extra spare battery from eBay for a standard 3 phantom? 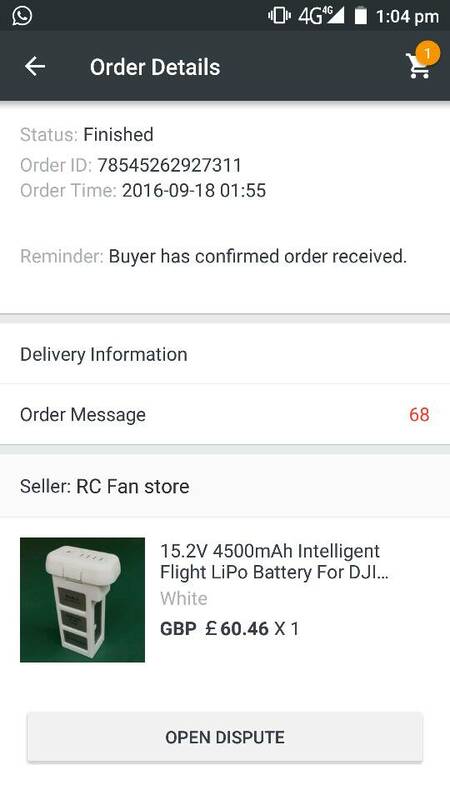 There are some authorized DJI dealers selling OEM DJI batteries on eBay. For example, here. I just got one for $70 shipped and only shows 1 charge cycle. The problem with non OEM is you don't necessarily know what you're going to get. The battery could be filled with soda pop for all you know. Obviously the safe strategy is to buy OEM. If you are tempted to buy non OEM, then it would be wise to only consider one from a manufacturer who has an established reputation (i.e. good reviews). Then measure risk/reward. Re eBay (and Amazon for that matter), you have to be careful. Some sellers will claim their battery is OEM when it is not. Sometimes the battery in the listing photo and/or the battery you receive will look (almost) exactly like OEM, but it is not. It's not always easy to tell the difference. Sometimes the battery you receive will look different than the battery in the listing photo, which is a bait and switch, and you should almost certainly return it. Re eBay (and Amazon for that matter), you have to be careful. Some sellers will claim their battery is OEM when it is not. There are authorized DJI dealers selling batteries on both eBay and Amazon. Buy from them and this will not be an issue since they don't sell knock off batteries. Are they fullashyte or what? Recommend retail is $100 north if that price. You may save $10 more shopping around. Special price for Australian market. It's a joke yes but getting tight with batteries is stupidity... Buy genuine or known to be good aftermarket. It's a lot cheaper than DJI's price though. DJI is selling them for $149 USD ($196 AU). $259 is the current price from DJI for delivery to Australia. I'm guessing that might be true for anything purchased from DJI in Australia. In the US, purchases over $99 USD are shipped for free.